Thanks to all for your concern. I'm fine but it's still raining. I've just returned from an 8am appointment dealing with Medicare Supplemental Plan F issues and am leaving soon to drive to the local Social Security office because the promised 'secure envelope' still hasn't shown up. I'm hoping they'll 'scan' the necessary verification paperwork into my file as a 'walk-in' today (at the suggestion of the last person I spoke to on the phone yesterday afternoon). Keep your fingers crossed for me driving over there & back ... and getting someone to help me follow through today. 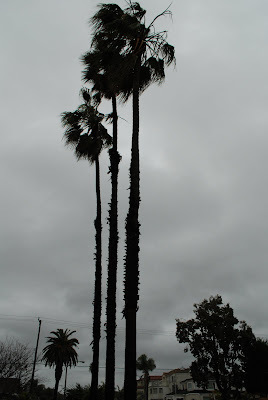 You do have gray moody skies lately! But they do make for great shots and what a way to appreciate your usual blue, blue skies! Have a great weekend! 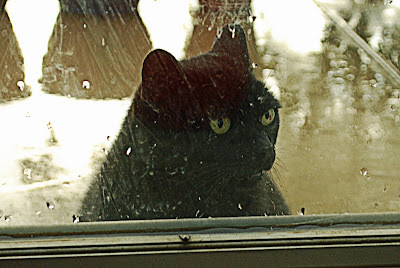 What a beautiful set of reflections here my friend, the cat looks like it's amazed with his image on the glass. Lots of great shots and various fun things to look at! Reflections are great! Even in the patio door, reflections seem part from inside and part from outside. I am still so loving the blue chairs! Are they wood or plastic? Soggy sidewalks create great mirrors! I love that palm reflection! I like those reflections on the sidewalks. Poor wet kitty. 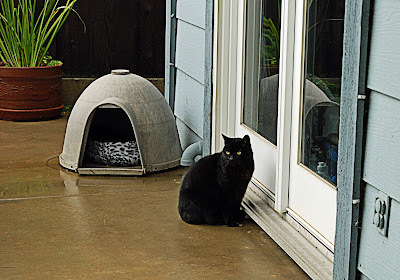 I tried to get my outdoor cats to come in and they REFUSED! Two of them prefer to sleep out in the garage and one is curled up in a box next to the front door! I like how you found interesting subjects in everyday things! Those are great; once again I feel that I have shared your day. Stay dry! You've outdone yourself with all these fine images. Great series and commentary. I love the reflection of the tree on the ground...beautiful and featured it in my blog! Wonderful selection of shots, thanks for sharing. I love all of those pictures! So sweet. I see Ms Kitty knows how to get your attention by pawing at the door. Our 18 yr old cat just learned how to do that. 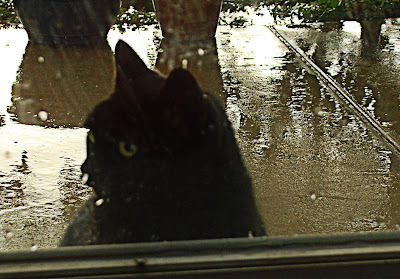 Ms Kitty looks so lovely in those pictures with the raindrops on the glass. 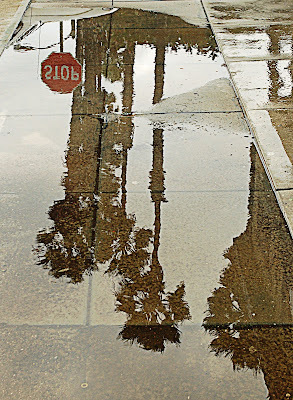 I also adore the palm trees in puddles, so many great pics! I love all the rainy day shots. 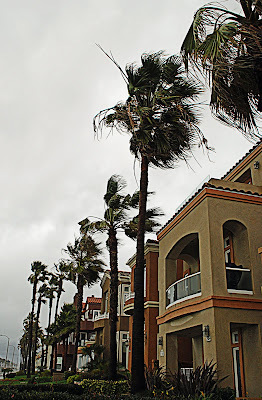 We are too cold here to have rain, but it's nice to see your photos. Good luck with getting all the red tape completed. 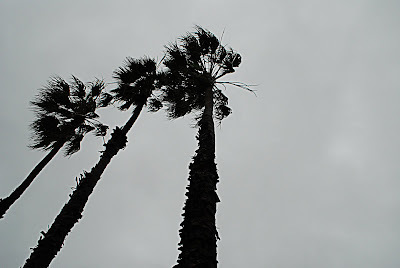 The weather may be gloomy, but you have shared such lovely photos. 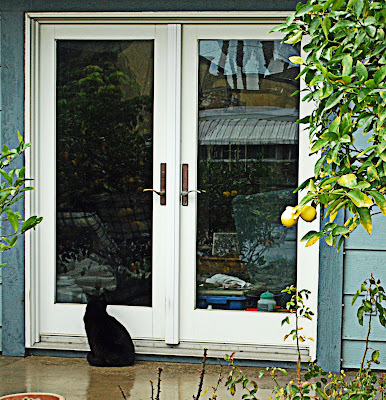 I love Miss Kitty, especially the shot of the door with her peering in! Great photos.Thank you for sharing them. That silly kitty! We used to have a girl like that. She was an abandoned cat when we adopted her and used to being outside. Took a long while to get her used to being in a nice warm, dry house. Love those reflection shots too! Enjoy your weekend! Poor fur-family!! 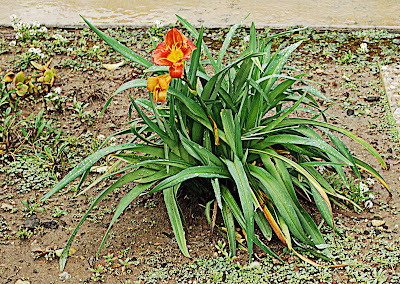 They need to come in out of the rains! 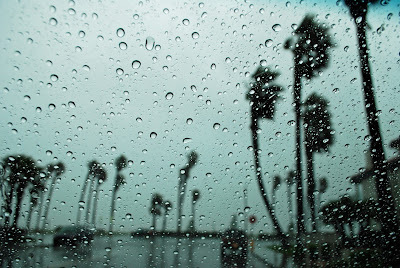 I've been wondering about you with all the CA rains and mudslides! 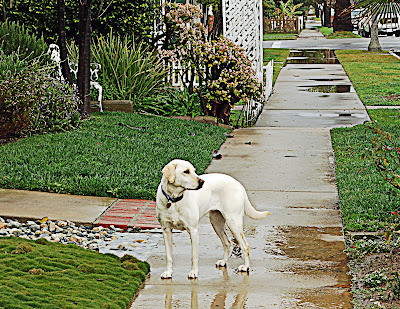 Wonderful set of photos, I love the dogs and the reflections are cool. 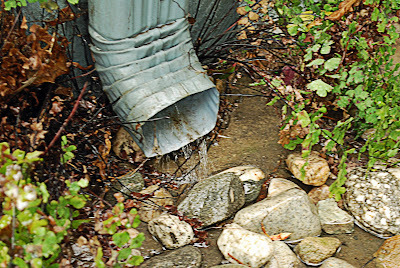 Are you surviving all that rain? HRG: Neat photos of your wet world with your neat animals. Beautiful post, I liked a lot the little black critter and the poem, fabulous composition! I hope the weather is better today! You found a lot of beauty to admire even in the wet and rain. I'd tell you which photo was my favorite, but I couldn't pick one. I love black cats, yours have a magnificent eyes. 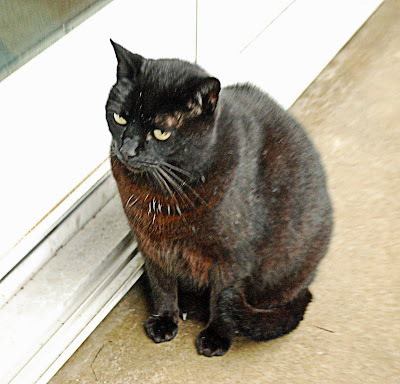 Ms. Kitty looks as if she's ready for the rain to end. I like the sidewalk reflections you've captured. Nice shots, I hope Ms Kitty made it inside to dry off. What great shots! I just love Ms Kitty! 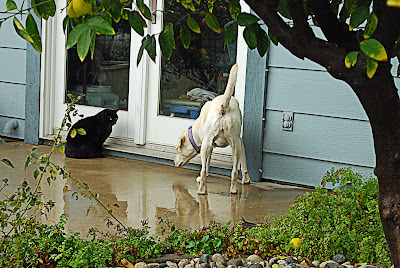 Ms. Kitty doesn't seem to mind the rain, and I'll bet Molly likes to splash in the puddles. Oh my gosh - such wonderful shots! 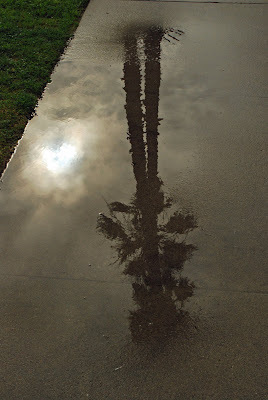 I LOVE the two shots of the reflected palms; especially the first one - lovely! Lovely selection of photos!! 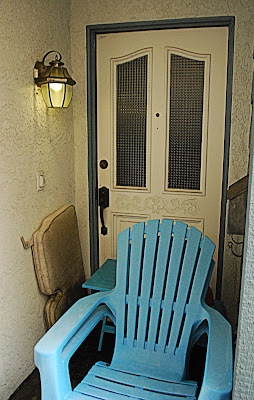 I'm loving the blue Adirondack chair!!!!!! Also your reflections of the palm trees are really great! You have a splendid Sunday! You have the happy knack of finding beauty and interest in all events. Wonderful shots as ever! 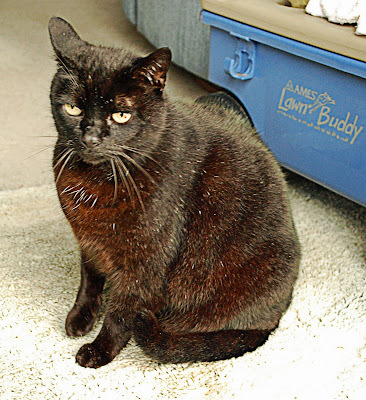 Love all these photos you've shared, those reflections are amazing and your little black cat? So adorable looking through the window and love that cute dog also. Hope you got everything taken care of and that all goes well. 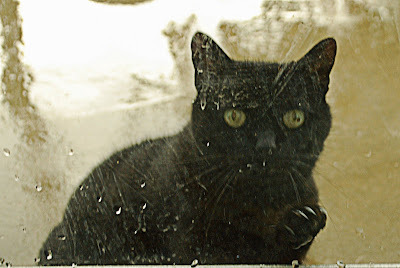 I really like that picture of the cat looking in the window! And that last reflection is just lovely! I love your photos today. Cute cat. 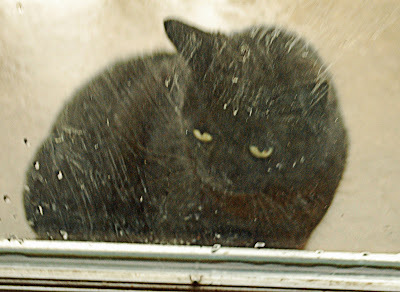 We have a black cat that hangs around here, but I have difficulty getting a good exposure due to the contrast. Yours are great. We had a bit of rain today here and my husband felt bad about the cats being outside. 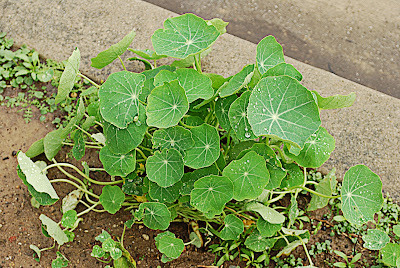 Is that Lady's Mantle? I love Lady's Mantle. Best wishes with your trek to the government.